Lesley Rodgers Your Personal Development Consultant, a photo by totemtoeren on Flickr. 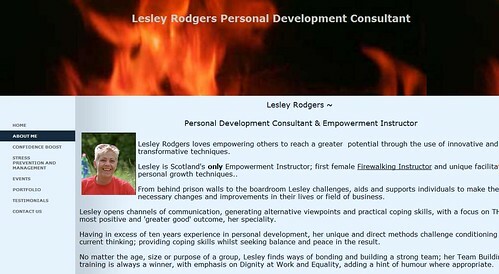 A Catalyst of Change... Scotland's one and only Empowerment Instructor ~ Firewalking and skills for change. Providing a professional personal development service for individuals, organisations and the business sector, innovatively tackling personal barriers to growth using transformational methods and experiential training. Firewalking Instructor since 1999, Holistic Therapist, Reiki Master/Teacher, NLP Practitioner, Change Manager and the UK's first ever Empowerment Instructor. Lesley is also a committed human rights activist. To catalyse necessary changes and provide coping skills for life improvement and personal well-being. Skype Consultations - business or personal.